Chicago police detained three suspects after a woman was mugged Friday afternoon along the Lakeview - Lincoln Park border. The arrests may be related to an on-going afternoon and evening robbery problem that has been plaguing the area since mid-November. On Friday, a woman was near the intersection of Mildred and Diversey around 3:45 p.m. when three offenders wearing medical face masks robbed her of her phone, purse, and coat, according to a police report. A witness to the robbery managed to take a picture of the offenders. Patrol officers working from the photo later detained two suspects near a McDonalds at 2401 North Lincoln and in a nearby DePaul University parking complex. The victim identified all three detainees as the persons who robbed her, police said. Thursday evening, a woman reported being robbed by two offenders—one of whom wore a hospital face mask—in the 2200 block of North Fremont. 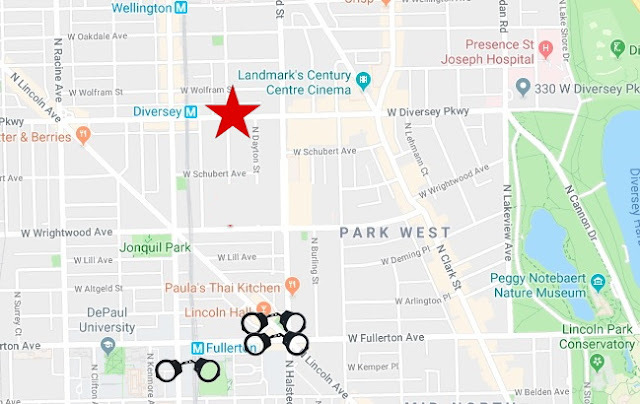 Details of the two incidents align closely with information contained in a Chicago Police Department community alert last week that warned about a series of robberies in the same area. A Chicago police spokesperson did not respond to multiple requests seeking details of yesterday’s arrests, including the ages of the detained individuals. CWBChicago will post an update when more is learned about any charges filed.